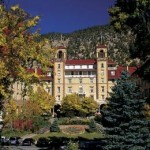 This historic hotel is believed to be haunted by two spirits. The first is the apparition of a young woman who is seen rushing through the hallways of the hotel. Her disembodied footsteps have also been heard in various parts of the hotel. The second is a ghost the hotel patrons have named ‘Rufus’, who is responsible for turning lights on and off, flushing toilets and moving furniture around. The ghostly phenomena is mainly reported in rooms #06 and #07. The sound of a dog barking and running through the hallways has also been reported by guests. I live in oak creek, co about 15 minutes away from yampa. The royal burned down during the winter of 2014.